I love the dress' soft blue color, as well as the texture. I'm not sure about the cut for Max but the rest of it is elegant with the taupe hat and shoes. The purse, now that is something else! It suits her, but unfortunately she does not feel comfortable with her "made". Gorgeous, Regal Queen Maxima! such joy! Beautiful well tailored fit and Love the dress and accessories. You may wish to call her "queen" consort, but many people don't respect her. Her character is flawed and she cannot represent all people in society because she cannot relate to the poor. Who says??? ?, you made it all up! Then why don't you prove it if it's not true. You know she loves money more than anything else. She is elegant as usual. Has anything happened to her? She has only one glove. That's because you shake hands with your right hand, you take of ypur right glove, that's polite. The gloves are not working for her. They look too cumbersome. Other royals have an easier time carrying them off. Max is ill-at ease with the gloves and protocol or not, she has not mastered the glove look. Eyes wide open with an eye lash curler. 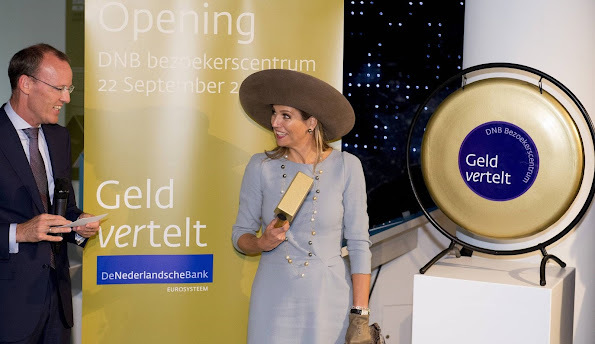 Maxima looking very elegant - she can wear a hat - any size or shape and it suits her. Yes, I agree, why does she has swollen knees? 20 people put her together so she can look half decent. So elegant .Everything is just perfect.